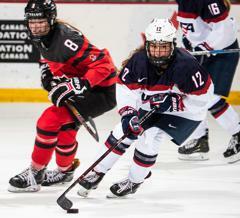 CALGARY, Alberta -- The U.S. Under-22 Women's Select Team completed a three-game sweep of Canada with a 2-1 victory, but the U.S. Under-18 Women's Select Team fell in overtime, 5-4. For recaps of both contests, see below. 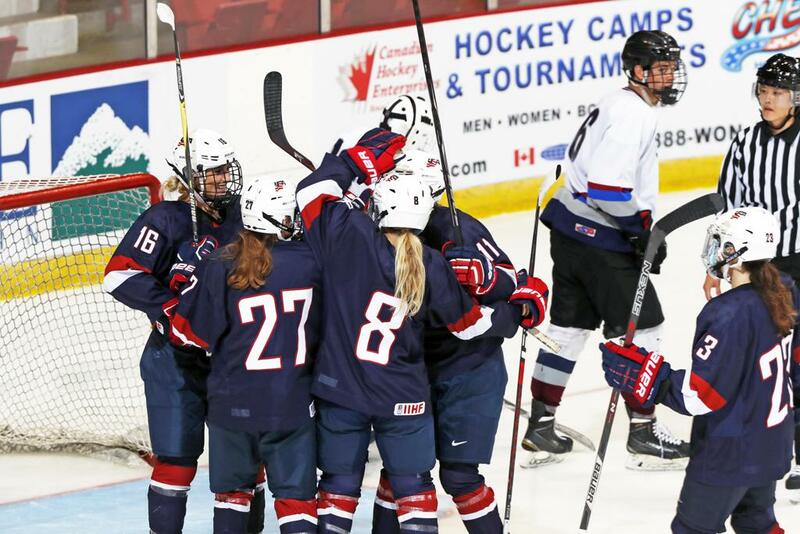 Maureen Murphy (Buffalo, N.Y.) scored the game-winning goal with 6:56 to play as the U.S. Under-22 Women's Select Team completed a three-game sweep over Canada at the 2018 Under-22 Series here today with a 2-1 victory. 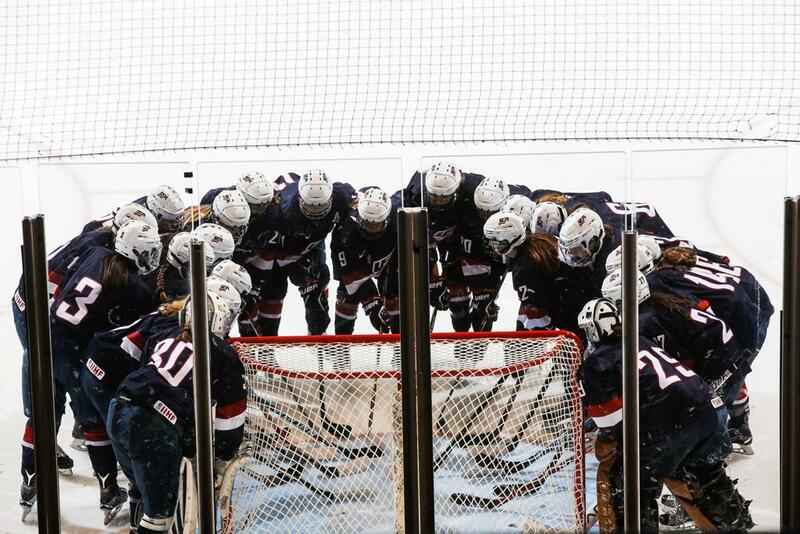 The U.S. Under-18 Women's Select Team closes out the 2018 Under-18 Series against Canada at 3 p.m. ET. That contest will be streamed live here. Nine minutes into the opening period Madeline Wethington (Edina, Minn.) created an odd-man rush when she won the puck from a Canadian defender in the defensive zone, skated end-to-end and sent a centering pass to Sophia Shaver (Wayzata, Minn.) streaking toward the goal. Shaver wristed one on net from the slot, but was stopped by Tricia Deguire. 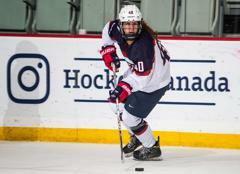 The U.S. broke through with a goal in the final minute of play in the first period when Grace Zumwinkle's (Excelsior, Minn.) one-timer from inside the left face-off circle was deflected in by Clair DeGeorge (Anchorage, Alaska) for the power-play tally. Emma Maltais scored the equalizer for Canada on a partial breakaway with 9:29 remaining in the second period, bringing the score to 1-1. Maddie Rooney (Andover, Minn.) staved off a 3-on-1 Canadian attack with 1:32 left in the middle frame to keep the score tied heading into the final period. The U.S. took a 2-1 lead with 6:56 remaining in the game. Caitrin Lonergan (Roslindale, Mass.) carried the puck through the neutral zone for a shot on net and Murphy was there to bang home the rebound for the go-ahead goal. Rooney made 37 saves to secure the win, and series sweep, for the U.S.
Hannah Bilka (Coppell, Texas) scored twice, but the U.S. Under-18 Women's Select Team fell to Canada in overtime, 5-4, here today in the final game of the 2018 Under-18 Series. With a two-man advantage, Ann-Frederik Naud took a shot from the left face-off circle that beat Skylar Vetter (Lakeville, Minn.) top-corner to give the Canadians a 1-0 lead with 6:35 remaining in the first period. With 27 seconds remaining in the first, Julia Gosling picked up a rebound during a net-front scramble and scored to give Canada a 2-0 advantage. Vetter turned away 19 Canadian attempts in the first period, despite the 2-0 score. Abbey Murphy (Evergreen Park, Ill.) had a great chance early in the second period when she manufactured a give-and-go play with Bilka. Murphy made a pass to Bilka on the endboards and streaked in front for the shot, but was stopped by Amanda Rampado. Canada added another goal 4:26 into the second period when Danielle Serdachny took a shot from the point that found its way all the way into the back of the net for a 3-0 lead. Midway through the period, Makenna Webster (St. Louis, Mo.) picked off a Canadian defender at the defensive blue line and broke away for a short-handed goal to put the U.S. on the board, 3-1. 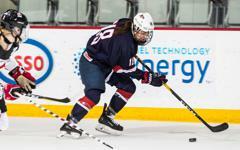 Bilka added a power-play goal when she scored from the left face-off circle with 6:20 remaining, cutting the U.S. deficit to one. Brooke Bink (Escanaba, Mich.) and Murphy picked up assists on the play. With less than two minutes to play in the middle frame, Murphy picked up a loose puck on the halfboards, skated it into the seam and took a shot that would tie the game for Team USA. With three unanswered goals in the final 11:25 of play in the second, the U.S. entered the third period even with Canada at three goals apiece. Casey O'Brien (Milton, Mass.) was sent to the penalty box 5:40 into the third period for a hooking infraction, and 1:10 later, Alexie Guay scored to give the Canadians a one-goal lead. With just 2:47 remaining, Bink led a U.S. breakout and found Bilka streaking down the left-side, who banged home the game-tying goal. The score would stand 4-4 as time expired, sending the game into a five-minute sudden death overtime period. 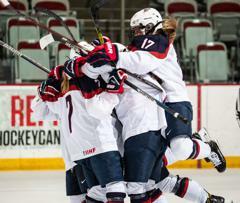 Guay netted the game-winner for Canada 1:43 into the extra frame. 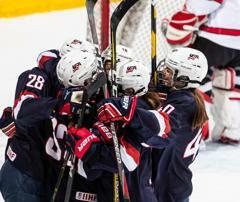 Vetter finished with 40 saves in net for Team USA. For full game statistics, click here.